I got some new files from our graphic designer. Here's our new Yellow Pages ad. These aren't exactly to scale. The map is a bit bigger on the full-scale version. This site is shrinking it down to fit. 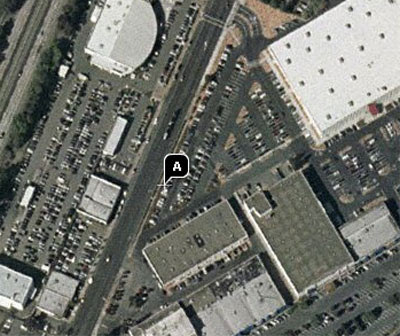 Yahoo has newer satellite images, but the resolution isn't as good. Here's the new place as it looks today. It shows that there's much more parking and development in the area. Usually when I'm stressed I throw myself into my games. I still take care of business, but idle thoughts are easier to manage with a brush in my hand or an adventure to write. In my mid-twenties a couple of close friends died and I wrote two D&D eBooks in my free time. It was therapy, I suppose. My IT career, which was tedious, found me creating spectacular D&D campaigns and adventures, usually while I should have been doing something else. My wife has been sick lately, which is how I got into Flames of War. Now with the stress of the store move, it seems a great time to start a new game! Warhammer Fantasy is calling to me. I've played the role playing game, which is fantastic. That led to my reading a couple fantasy novels as well, which I really enjoyed. I've played a couple of games of fantasy battles with other peoples models (OPM), which was enjoyable. Now with our new Mighty Empires campaign starting the first day in our new store, I'm very much tempted to start an army, despite not having any time. The army that calls to me are the Ogre Kingdoms. Maybe it's a mental backlash against all those little Flames of War models, but I want to play something big, really big! 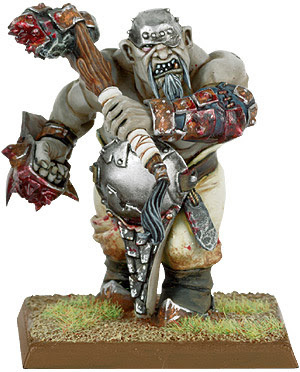 Another advantage is that they're the German army of Warhammer Fantasy: very few high point value models. I would have to paint, obviously, but far fewer figures than say goblins. It's also fun to play a "Shock & Awe" army. When you put down those giant, powerful figures, there's no mistaking that there's going to be some pounding. I played Skaven when we had our Mordheim league (great game), and Ogre Kingdoms seem like the opposite of the sneaky hordes. I just got back from half a day at the San Francisco Gift Fair. If you ever worry about the Walmartization of America, just visit one of these sprawling fairs of specialty items. It was at the Moscone Center and took up three large halls. The Gama Trade Show (GTS) takes up one hall at best, so I was certainly impressed with the market for this stuff. I also haven't seen so many women in one place since college. A small amount of the fair applied to my interests. There were a handful of game and toy companies, enough of them to make the short visit productive. I put in orders with Screen Life (Scene-It), Wood Expressions (classic games), and The Lagoon Group (my supplier of fake dog poop and puzzle games). I also got to say hello to my toy rep who will be providing me Thomas Wooden Railway stuff and John Hansen puzzles and games. 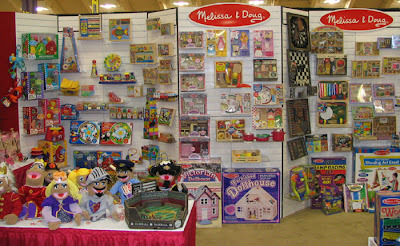 Melissa & Doug was there and I was able to see some of the many items I have coming from them, and a possible offer to help set up the various racks when they arrive. I've got racks of puzzles, train track, craft supplies, and much more. 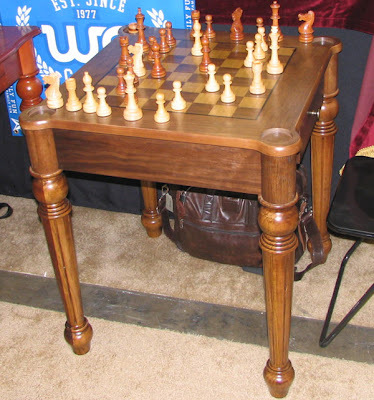 Wood expressions has new chess tables. I'm planning on showcasing this one in the store. Melissa & Doug: "bread & butter" toys. These are the toys you expect a quality toy store to have. They're high-quality yet affordable. We don't need anything fancy from Europe here. They're good enough at an excellent price point. The rep told me one of his accounts described M&D in dating terms: You want to go home with that hot person at the end of the bar, but you're going to go home with the cute one whose talking to you. Maybe we should suggest a new marketing slogan? Customers sometimes cringe when they look at the price of the latest D&D book. "Why are these so expensive?" they ask. I decided to answer that question. The first step is figuring out the baseline. Expensive compared to what? 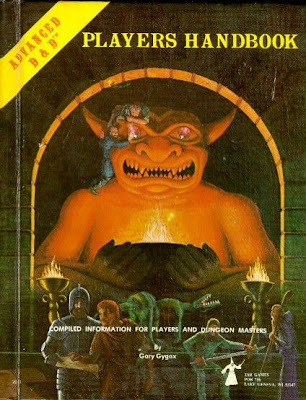 In 1978, the1st Edition AD&D Player's Handbook cost me (more likely my mom) $15. This was a black and white book of 127 pages. It was a fantastically creative book that we practically memorized over the coming years. Mine traveled with me on my back through junior high school and most of high school. Back then you could carry every D&D book in a large backpack, and if there was a game after school, sometimes we did that. I sometimes wonder why I didn' t have a girlfriend until college. 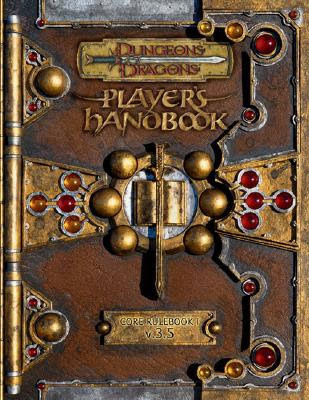 The 3.5 Player's Handbook printed in 2005 is full color, 315 pages -- way over twice the size as the original and prettier -- and retails for $29.95. It's certainly a creative masterpiece as well (I think), although we're still unsure of most rules since the 3.0 upgrade. We have a hundred other books to read (121 to be exact), so memorization is out of the question, as is carrying the entire collection in a backpack. I see no love for this book, only acceptance of its utility. Back to the numbers, we can see that the 3.5 book is possibly twice the production value of the original AD&D book. With a $15 (1978) versus $30 (2005) price difference, does that mean all things are equal? Not even close. How much would that original AD&D book cost if adjusted for inflation? Looking at an inflation calculator we get $48.19. That's right, the black & white original was way more expensive. Gaming books have actually gone down in price, adjusted for inflation, with massive increases in value. I think the pain and dismay comes from the dearth of new material. It might seem like an embarrassment of riches, but a lot of players are exhausted from those regular releases. They either bite the bullet and buy each book, or they put in place various house rule moratoriums on new books: You can only use core books, or books the DM owns, or Complete books, or the books listed on my website. I'm clearly a D&D gamer because I anticipate and highly enjoy getting that new book, but even I hesitate to take every one home, and I get them at cost! 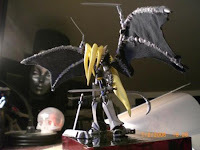 If you're not financially able to keep up with the hobby, it can be very frustrating and it can seem like an exhausting obligation rather than the wonder and excitement it once was. I've had a couple of game store employees so far, and the first thing they do when they see their first product invoice is begin adding up the math. "Wow," they say, "you got that $50 board game for only $25. When you sell that one are you going out to dinner?" That's a slight exaggeration, but it says they don't understand the economics of the situation. The same could be said for customers that demand discounts or expect me to compete with online retailers. The bottom line is that a game store can expect their profit to be around the rate of sales tax. Let's figure 7%. So that $50 board game, if everything is in balance, will net the store owner about $3.50. So nobody's going out to dinner, but a cup of coffee isn't out of the question. If I had given that customer a 10% discount, you can subtract $.70 from that amount and it gets worse from there. The average game store nation wide does about $200,000 a year in sales. Sounds pretty good if you look at your salary, right? Now multiply that by 7%. That's $14,000 a year. Don't quit your day job just yet. So where did that $186,000 go? Is the owner expensing his Lamborghini? And what about the tax they're always charging me? Sales tax is at best a short, no interest loan to the store owner. They collect it and don't have to pay it to the state for 3-4 weeks. At worse, sales tax is a burden fraught with perils. You've got to collect it, track it, fill out forms, send in a check and if you're late, oh man. The State of California just passed a law that penalizes a late payment by 50%. Imagine your credit card company doing that to you. Oh yeah, and don't be wrong or that's another penalty. $25 goes to buy another game to replace it. Many board game companies like Days of Wonder, GMT and Fantasy Flight Games have slashed their discount, so that game might cost $26-27.50. Who makes up for that $1-2.50? Hmm. See profit below. $9 goes to pay the guy who sold it. Most game store employees make around minimum wage. We pay about $9/hour, which in California is close to minimum wage. In San Francisco, which wants to run itself like its own country, minimum wage is legally $9.14. If the store was there, they would also regulate which toys I could sell based on their composition. $6 goes to pay the rent. They say (they being smart game store owners in the Mid-West) that rent should be about 12-13% of your gross sales. My California rent is actually about $7.50 in this equation, which hurts my profits. We're going to fix that soon. $2.50 goes to profit. Don't forget taxes (make that $2.50 a free and clear $1.65). $2 goes to pay utilities in the store. Electricity prices continue to rise and they're higher than residential prices. $2 goes to merchandising, office supplies and misc. Making displays, buying labels and register tape, printer paper, etc. They add up. $1.5 goes for advertising so people know the store exists. This can be as high as $2 for some stores. It's a percentage based on gross sales (around 3-4% recommended). $1 goes to credit card processing fees. If you used your Visa or Mastercard. It's $2 if you used an Amex or Discover. Who do you think pays for all those rewards? That would be me. $1 for insurance. This covers the store and workers comp insurance for the employees. $1 shrinkage and shelf wear. Our board game didn't get stolen and it didn't get damaged sitting around, so you can represent this as a savings account for such items. On average, a store will pay 1-2% of their gross for items that walk away or get damaged. Our number is lower (figure that number goes to subsidize rent on our small store). Love of games will take you so far. This kind of math is what many self-employed people put up with for their independence and happiness. I make about a third of what I made in my previous career with 50% more hours, but I enjoy going to work in the morning. My labor is my own. I think games drive people to own their own store but the rewards of self-employment keep them there. I ordered more shirts today. The old shirts are wearing out, plus they have "Walnut Creek" as part of the logo. The biggest reason is new employees. I've got several new part-timers planned. These guys (all guys so far) will work late afternoon and evening hours. The plan is to have them cover the busy after-work and after-school periods and then stay until closing, around 10-pm. It would be better to have full-time people, but I'm not sure I can afford that yet. I've also got one younger high-school kid planned for Saturdays. In case you were wondering, the primary requirement to work at Black Diamond Games is that you wear a size large shirt. with button-down collar. Wood-tone buttons. This evening I was standing in line at FoodMaxx with, about 8 cases of soda, wondering how I was going to write this "day in the life" article about running a game store. I was distracted though, because of the soda and the task lying ahead of me the next morning. My most dreaded task is one only I can perform. It's not balancing the books or managing employees, two things I also don't care for that only I can do, it's loading the vending machine. When we started a few years ago, I had the bright idea of buying my own vending machine. The intention was good, but the execution was not so great. A drink cooler would have been smart. A vending machine is an uppity mechanical anachronism best left to professionals. The one I purchased is based on an old fashioned design. It takes exact change only, can be disabled with a nickel (the exact wrong change), and has an archaic loading process that literally tests my nerves. This drink machine has cans lined up on horizontal ramps. When exact change is inserted, the cans roll backwards down a horizontal ramp, through a metal gate, down a chute and arrive in front of a door at the front of the machine. There are very specific loading instructions. The bottom cans have to be loaded first and then each row is loaded from bottom to top. It's a really simple process in theory. In reality, this design is antiquated. It's based on an alternate reality in which cans are constructed with reasonable amount of aluminum. Today's cans are extremely thin. If you load according to the instructions, about one in ten cans will develop a pin prick of a puncture as it slides down the ramps and hits open gates and other cans. Since the can is getting a good shaking from the loading process, this tends to spray high fructose corn syrup onto the other cans and throughout the inner workings of the machine, which later makes its operation even more problematic. Once a puncture develops, you have another problem. To get that bad can out, you need to unload all the cans in front of it, and using coins to actuate the machine! This is done while that bad can is spraying a fine mist of soda over everything, including you. So by the time you get that can out, there's usually soda running down the ramp and all the other cans of that type are sticky. Worse, once the cans have been through the loading process, the can's structural integrity is a bit suspect, which increases the odds that re-loaded cans will puncture. It's almost better just to throw them away and put them in the fridge for later. Loading the vending machine then is very much like loading bombs. Rather than following the instructions of letting those cans roll down the ramp and smack around, I carefully insert the can, stick my arm into the machine, and gently roll the can into place as much as possible. If I'm lucky, all the cans load properly. If it's not my day, if I'm not lucky, I'm likely to get a spray of soda on my shirt, arms, and glasses that will leave me sticky all day. My only time using profanity in front of a customer was when this happened. So now that I'm planning to buy a cooler (thanks Chris), I'm debating on whether to keep the vending machine or dump it. I really like my new business card design. Note the new phone numbers for the new place. We couldn't keep the old numbers, unfortunately. With Jeffrey's advice (a friend who also posts here), I added a third line for my office number and I'm forwarding the old number to this new number when we move. That way I know when people are calling the old number and I can give them the new number. Originally I was going to have a recorded message giving out the new number, but after all the money I've spent getting people to call that original number, it makes sense to transition it properly. With the office and business lines, I had to buy new two-line phones. 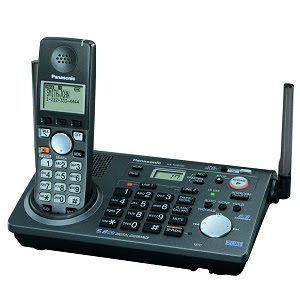 After lots of research I went with the Panasonic KX-TG6700 with a second wireless phone for the cash wrap area. Besides handling two lines, it has call waiting, conference calling between phones, intercom, and phonebook sharing. Really I just needed a dependable two-line phone. I'll be posting the new yellow pages ad and direct mail flyer when they're done this week. My graphic designer and I are working on them. I also hope to have a mock-up of the new lighted sign soon, shown against a photo of the new building. We're going with a channel letter design on a raceway. It was $1200 cheaper than the very cool, but expensive, halo lighting and about $500 cheaper than channel letters without a raceway. In the category of cool and I need to get some for the store is Stikfas. Stikfas is a Singapore company that sells only to specialty stores. The name comes from combining the words stick and fasten. 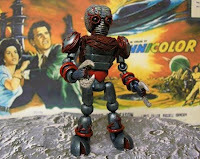 This is one of those products that seems to bridge toys and games. They're stick figure like men and vehicles that come on plastic sprues, akin to Warhammer. I envision a young kid putting these together and playing with them (no game, just toys), while an older brother assembles and paints his 40k. In reality, they'll probably all go to 40 year old guys. Anyway, I want to play with them myself, so I must be partially right. Your typical sprue (below). They snap together so no toxic finger bonding glue required. 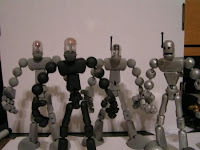 The figures are posable and can be customized across the line. The event schedule for the new space is coming along. Some of the events are one time events, some are planned as quarterly events, and others we hope to hold weekly and build a following. If you're looking for an event and don't see it on the meetup site, let us know. 11/4: Third Anniversary and Grand Re-Opening Party. Come join us in celebration at our new Concord location. Lots of food, gaming, children's activities and much more will be provided. More details will follow as we get closer but be sure to hold the date! 11/10: Game Auction and Ding & Dent Sale. 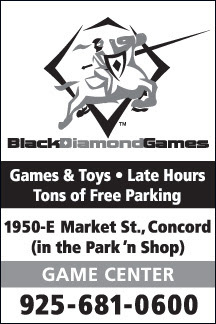 Bring your games to auction off for store credit, find a used game bargain or come find a great game from our slightly damaged, but new, Ding & Dent products. This will be a quarterly event. 11/17-18: Board Game Mini Convention. Come play every type of board game with people from around the Bay Area. We expect several game designers and game companies to be represented. 10/13: Magic the Gathering: Lorwyn Release Tournament. This will be another DCI sanctioned Magic event. 10/13: Warhammer 40K Apocalypse Release Event. Apocalypse is the large scale battles rules for Warhammer 40K. This worldwide event is still in the works. You can read more about it on our meetup site. Hosted by Michael Usi. 10/20: Hordes Evolution Stampede Event. Celebrating the release of Hordes Evolution, this custom event features prizes for winners. 11/3: World D&D Day. This annual event lets anyone walk in and play a custom D&D adventure created specifically for World D&D Day. We're looking for volunteer DM's. We have two sessions scheduled with plenty of space for both sessions. 9/26: Warhammer Fantasy Battles (Mighty Empires). Our first day open will inaugurate this new Warhammer Fantasy Battles event. It will use the Mighty Empires terrain hexes to show where your various armies are located. Like all our events, everyone is welcome. Hosted by Griffin Barber. 9/29: Saturday Night Flames of War (NEW). This weekly event will go from 5-9pm and will feature a 800 point infantry league. This size league is perfect for new players or those who want to focus on smaller scale combat. Hosted by Joe Baptist. Friday Nights: Star Wars and D&D Miniatures. Friday Night Magic is in the works as well. This morning I get keys to the new place! That's one of those "milestones" for this project about as important as signing the lease. I'm meeting with my landlords contractor to see if any of our demo and construction work can be combined to save a little money. I've got a contractor already that I'm happy with, but it doesn't hurt to talk and compare prices. The thorn in my project's side right now is the exterior sign. When I moved into my current place, there was a sign box already there. The expense for making and installing my new plastic sign was about $700. This new place has absolutely nothing on the front. A sign box is what I was planning, which turns out to cost me an additional $1000 ($1700 total). I was told yesterday that it's unlikely to get approved by the owners because it doesn't match the style of everyone else's sign. The alternative is channel letters (about $2700). We may be able to save money with channel letters on a raceway. A sign box is easy and cheap. You wire up this big box in one place. Install some really long fluorescent bulbs, and slide in a long plastic sign. Channel letters are complicated and expensive. You hand make every letter. Each letter is installed directly to the front of the building in two places and is individually wired. Channel letters with a racetrack is a possible compromise. You install the racetrack on the building and wire it for electricity and then attach the channel letters to the racetrack. The labor is less but the parts are more expensive. wired in a series connection. Our current "light box" sign. Crude, but effective. I feel so dirty after talking about D&D 4.0. Here's something more positive. These are things that I'm personally excited about. They're not necessarily great sellers, just really cool things that fire off my imagination. Modular, plastic 3-D terrain hexes that let you create your own world. Arrange them how you like, paint them, and make that 3D map of your home brew world, regardless of what game system you play. Yes, there are rules, which I'm told blow, but rules aren't necessary for something this cool. I've got this campaign world I've been thinking about for months now based on ancient Lebanon. I may never get to run it, but man would it be cool to map out with these! 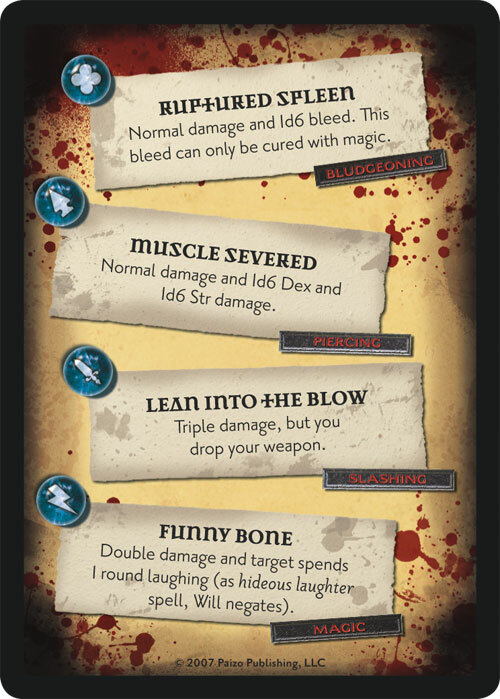 Crushed Intestines: Normal damage and 1d4 Con bleed (DC15 Fort negates, save each round). I use the deck in my D&D game and the player's have insisted that I use it against them as well as for them. They have them for the Brits and Germans too. These add some character to my armor that I've tried to fix by buying other company's decals. The names will mix well with my other decal's names. It occurred to me that I'm probably the only gamer who hasn't mentioned the inevitable D&D 4th edition in their blog. Just like most of the other blog entries, I know nothing about what's really going on, only rampant rumor and speculation. Today, WOTC announced their D&D product line-up for Q1 of 2008 and D&D in it's current form is there, although it seems conspicuously absent of supplements. No Complete books or clever accessories, just some Eberron stuff, some tiles, an adventure, some miniatures. I've never seen modern D&D releases so sparse. The second half of 2007 looks like a lot of end-of-life D&D products. It's reminiscent of the late products for 2nd edition AD&D. They still look interesting, but nothing innovative or stunning. Because it's required by law that I speculate on such things, let me predict that we'll have a Gama Trade Show announcement in April 2008, with an August 2009 Gencon release of D&D 4. Some of my contacts in game distribution swear that WOTC will make the announcement to the game trade first. Then again, communication hasn't been their strong suit lately. Maybe they'll announce it at a book fair. As a store owner, I think it will be good for business in the short term. However, I'll support D&D 3.5 until the books are unavailable. It might kill the game in the long-term. If it somehow grabs kids, like in the old days, then it has my blessing to do whatever it wants. Make it Fate based. Use Gummi bears as miniatures and eat your dead. I don't care. As a store owner, I think the lack of information is hurting 3.5 sales. As a player I don't need or want it. Then again, I said that about 3.0. As a player I hope they gore some holy cows: Vancian casting, tight classes, alignment. I hate the legacy spell system. In other words, I play D&D, but I don't really like D&D. As a player I hope it's less tactical and miniature focused, but I hear that won't happen. The good news for the day is that our heating and air conditioning units have been completely replaced in the new space. That should save us a lot of money in energy efficiency. 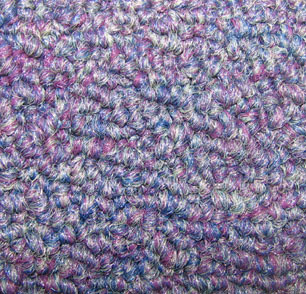 The carpet is called Plum Crush by Designweave. It's much darker than how it looks here. My flash washed it out. It's a mix of blue and purple. The carpet will be in the retail space, game room and office. The game room features some cool Race Deck tile in black and purple. The walls will feature our birch colored slatwall with black inserts. The paint will be a tan Kelly Moore paint called Snip of Tanin. The restroom paint is Kelly Moore Blanco, a tan gray color (not shown). Using Google maps, my photos of the shopping center and some Photoshop. The photo looks old, based on how Fry's looks now. The parking and walkway on the left hand side of Fry's has been cleaned up quite a bit. Right now it looks like a dirt walkway, but it's a paved sidewalk with even more parking. For food, we've got the Makiya Sushi place, which I'm told is fine, but not as good as our Nama Sushi. There's also the Hostess Outlet on the corner. A big wildcard for this location is the place next door. It's vacant right now with no plans for a new tennant. It's a rabbit hutch of walls, half floors, and unusable space, about 2100 square feet. It used to be part of the space we're taking. The space we're taking used to be the Paris Beauty College and the empty space next door was part of it. There are still doorways between the two locations that will be removed this week (in theory). The fabulous pink walls will stay until our build-out in mid-August. 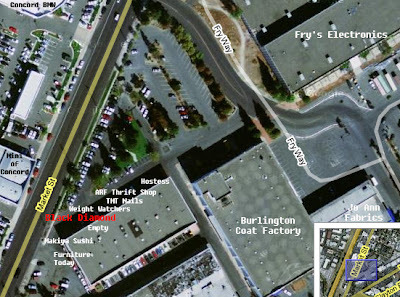 This map shows the path from the old store (green at the bottom) to the new store (red at the top). It's 3 miles, or 9 minutes away. When it comes to game store inventories, I see two major approaches: Shock & Awe and Natural Selection. There's a third type called Total Chaos, but I don't need to explain to you what that looks like. Shock & Awe. This is the game store that seems to have everything. It's an old-fashioned way of running a store, or possibly an intentional method if there's little competition. You stock full lines of products; every Rio Grande game, every Warhammer 40k item, everything that a customer could want. This is a "pull" approach to inventory management. You have the stuff, you wait for the customer to come in and get the stuff. It's all there for the taking. Fewer stores still use Shock & Awe because it's expensive. You're likely stocking items that sell once per year or even less often. You're really making a marketing statement, saying that you have EVERYTHING. No need to go elsewhere. Shock & Awe. From a retailer perspective you might have a quarter million dollars in inventory and you might sell through that inventory twice each year ($500,000 in sales or a turn of "2"). My guess is that most Shock & Awe stores don't even calculate turns. They don't care. The ideal store is a Shock & Awe store that has some "push" elements, AKA a knowledgeable sales person who can guide you to the cream of the crop while offering and being knowledgeable about all other options. The store that best exemplifies this is my favorite game store, Gamescape San Rafael in San Rafael, California. Natural Selection. This method uses intensive inventory management techniques. It requires that the manager carefully control inventory and to prune out items that under perform. You don't stock all of Rio Grande, just the top 15 games that sell well. Maybe you order in a couple slow sellers that you rotate through over the year, like crop rotation. You might stock full lines of products like Dungeons & Dragons, but you carefully prune out items from even your most popular games. From a retailers perspective, you might have $125,000 in inventory, but because of your inventory management skills, you sell through that inventory four times a year ($500,000 in sales or a turn rate of 4). Your very efficient with your dollars, but your customers aren't quite as happy. In this scenario, it's very important to "push" the products you have, to showcase the games that are popular in your area, and to be very aware of your customer likes and dislikes, the games they're waiting for or don't care about. It's up to you to tailor your store to the local demands. That's the requirement of Natural Selection. I try to run my store like that. It can sometimes be a mercenary process and customers aren't always happy, especially new ones that wander in expecting an obscure book that nobody seems to play locally. Both models are valid. Both require on-the-ball sales people and management to run properly. There are local "Shock & Awe" stores that have bad service, and the benefit they gain from their strategy is diminished because of it. Poorly run stores with "Natural Selection" fail very quickly, as their unable to put their finger on the pulse of their customer base. Customers will always appreciate more inventory in a store, but they won't necessarily buy more if it, just because it's there. The Ennie award website is here. Check this site out berk. Well designed and tons of information on Planescape, the old 2nd edition D&D campaign setting where you walked the planes. It was part philosophy (implemented bizarrely, but workable) and part planar adventuring. It was immensely fun but it turned off most people (which can also be immensely fun when you're young). My old Internet buddy Brannon Hollingsworth has done a great job on this site. It has a few of my older articles in the encyclopedia section. I used to run a site called Tale of the Bariaur for 2nd edition D&D. It had over 100 articles and two full downloadable books: The Bariaur Book of Belief and The Complete Book of Bariaur. You can read a tiny selection from the site by searching for my name in the articles section. I had way too much time on my hands back then. I think Brannon has most of those articles in his Mazed Archive, which isn't online yet (after about 7 years). I gave him the site when I moved on to other interests. This was in that limbo period when TSR was no longer around and D&D was languishing. I personally spend most of my time on Monte Cook's Ptolus.com, which I would have voted for if it had been nominated. Ptolus.com has a lot of free articles, sample product downloads and a hopping message board. I'm a big Monte Cook fanboy. It's 'cause I'm a D&Der. Have Games Will Travel is what I would vote for if I was more into board games. I download every episode but I don't have time to listen to most of them. 2d6 Feet would get my award if the award wasn't narrowly defined as "fan based." A tough call. If you only published one book and it was good, is that enough? In that case I would give it to Malhavoc for Ptolus or Evil Hat Productions for Spirit of the Century. Green Ronin is the most consistently good publisher on the list, and I give them much credit for the Black Industries products as well. I sold cases of their Deck of Many Things. Paizo, on the other hand, is on a tear. They seem incapable of doing wrong. They're not only prolific, but they seemed to have created an entirely new market in RPG accessories. I call them "just good enough products." They keep the costs low, the quality good enough (not great), and they have innovative ideas. Customers love them. As a D&D player, I find myself using a number of their products every session: Critical hit deck, combat tracker, and even the miniatures from the Compleat Encounter products, although they sold poorly in our store. Those were early efforts though. Because it's really cool. It makes me want to pick the book up and start reading. The title block uses a font that screams pulp. Pulp is what's hot right now, with Pirates waning. OK, based on a graphic novel called Iron Empires, it's kind of cheating. But if it qualifies to be nominated, it clearly wins. Check out Qin though too. Pretty great artwork. Just amazing. The city maps are highly detailed. At times there will be pullouts of that map, or tour book like walking maps. Imagine a temple district map where you feel like you're walking down the street as you read the description and look at the map. Monte Cook used tour guide books from various cities as inspiration. The "dungeon" like maps are also well done and usable. The fans have taken many of the maps in this book and have used programs like Dundjinni to make "battle maps," 1-inch grid maps for miniature play. I've got a 7'x3' printout map of the rat warrens that one of the fans made for me on request. I think I spent about $70 on ink that day. This is a once in a lifetime product that could not be attempted as a planned product. Ptolus was the original 3.0 play test campaign by Monte Cook. The early WOTC designers went through this campaign setting and stretched the boundaries of what was possible. D&D 3.0 came into being here. Monte Cook is the guy who wrote much of the D&D 3.0 rules. He's a very good fiction author. He's the head of his own publishing company, Malhavoc. This perfect storm of rules mastery, story, and control of production means you get a unique, expertly conceived and executed game product. Nobody could undertake a project like this today AND have the chops to make it happen. Oh yeah, so what makes it best production value? You've got a full color, 700+ page book, with a packet of color maps and player handouts. You've got a CD with several additional very good books that were previously published. If you pre-ordered, or even buy it from BDG today, you get the Night of Dissolution print adventure for free. You've got enough adventures in the book to go from 1st-22nd level, at least TWICE! There are numerous fully-fleshed side adventures, and many adventure seeds for the creative DM to turn into adventures. It's a full campaign setting as well, all for $120. Wow, big price tag you say, but what if you wanted to start a D&D campaign with adventures, what would it cost you? A campaign book is $40. A region book is $30. Say you want to run the best 1st-20th level adventure out there, Shackled City, that's another $65. You're already over the Ptolus price and you're getting a lot less without that tight integration. I haven't read any of those, so I have no opinion. Children of the Horned Rat is the one that customers rave about. An application of the Fate system (a Fudge variant) that's easy to pick up in just a few minutes. It's eminently playable, and re-playable, unlike some "story games." I just re-ordered nine, yes N-I-N-E more copies yesterday as they sold out quickly during yesterday's Spirit event. The only complaint from our group is that some house rules for character advancement would be nice. In my store, this book has outsold the D&D Player's Handbook in the period it's been around. How's that for the strength of indy RPG's? Best Adventure: The honourable mention should probably get it: Age of Worms by Paizo. Best Supplement: I don't like any of these. I would give it to Black Industries Renegade Crowns, a useful region building sourcebook for any fantasy game, not just WFRP. See above for my fan boy rave. I've got the additional speakers and switch box for the stereo system in the new store. That brings our speaker count up to eight, so we can have music in the game center and the retail space. I may buy special volume nobs that let me adjust volume in each area. I'm going to buy an XM Radio Satellite Receiver for the store today. XM has a soundtracks station called Cinemagic which seems a good fit for the store. For example, the music playing today on Cinemagic comes from: Sin City, Star Wars, The Lord of the Rings, Gladiator, Kill Bill, and much more. There's a large variety, without commercials, and best of all no legal headaches. You can check it out online for free here. Let's take the example of a small bookstore, under 2,000 square feet. The store plays CDs through two speakers, and does not have live entertainment, does not sell CDs, nor does it have a cafe. This owner will pay an annual sum of $524.64 in licensing fees: $190 per year to ASCAP (which bases its basic annual fee on the number of speakers); $152 per year to SESAC (which bases its basic annual fee on square feet); and $182.64 per year to BMI (which bases its fees on square feet). Or I can pay the XM commercial fee of $27.95/month ($335/year) with the added benefit of having satellite radio in my car. "Ah hah!" You say. Now I see why you want XM. For your personal use. Actually, having XM is just so darn cool for me, it's kept me from getting it all this time. Now I can justify it a bit better. 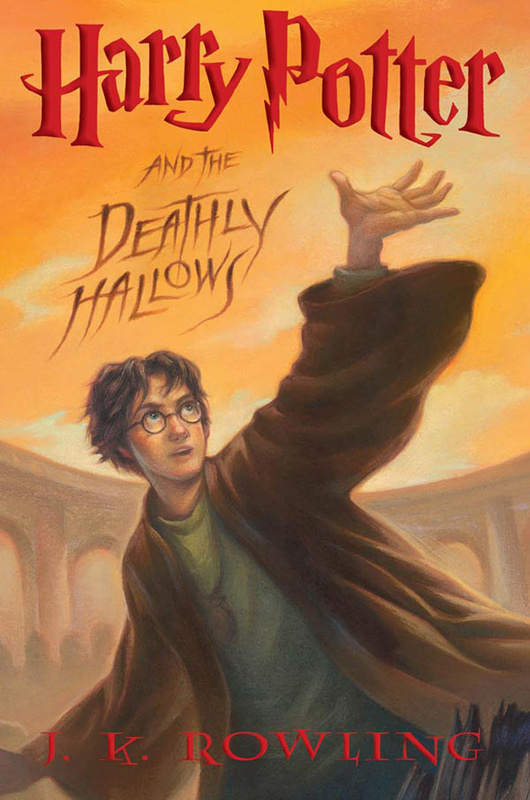 We have our Harry Potter and the Deathly Hallows shipment in an undisclosed location. I can't tell you where it is. It could be in my office next to my chair, or possibly in an armored car circling the building (pick one). The books were printed in a secret location with alarms on the pallets in case they've been tampered with. Really! I'm not kidding. To receive my books, I had to sign a four page legal document with Scholastic and my book distributor (very different from a game distributor). The document stated that I can't sell the book early, display the book early, tell anyone where the books are stored, allow employees or myself to borrow or view the book, and all under penalty of serious legal action. I definitely can't take a picture of the cover and show it on my blog (see below for those who claim to have done so). In fact, I haven't even opened the box. It might not even have the Harry Potter books. It might contain a dozen copies of the number 3 book on Amazon, A Thousand Splendid Suns by Khaled Hosseini. 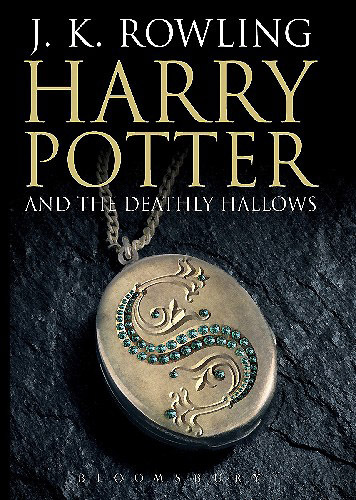 The new Harry Potter book is number 1 and the book on CD is number 2. The penalties for breaking the rules are severe and they do take legal action. You can see what happened to those who broke the rules here. The offending companies are facing a $200,000 lawsuit. So this four page document has some teeth and surprisingly, the leaks are extremely limited. I remember it used to be worse with earlier books, but people learn quickly. That's why I have such a problem with Wizards of the Coast, the 500 Pound Gorilla of the game world and the publisher of the most popular role-playing books. About 60-70% of all role-playing books sold are from Wizards of the Coast. So it's been frustrating that over the last several months, at least three books were released early to the book trade, which uses book distributors instead of game distributors. The book trade, comprised mostly of Barnes & Noble, Borders, and other large stores, broke the street date by selling them early. This included the hugely popular Star Wars Saga Edition and a couple Dungeons & Dragons releases. I don't think the book trade intentionally broke the date, Wizards just didn't do a good job of letting them know. A four page enfored contract probably wasn't necessary, but maybe a magic marker with a date on a box could have worked. The game trade got apologies from Wizards the first time, more apologies the second time and a promise to fix the process, and then the third time.... silence. It seems the game trade, at least small vocal stores, aren't worth their time. Street dates are an honor system (lacking a 4 page contract). They level the playing field by requiring vendors to sell product on the same date. It lets the store with the 7pm UPS delivery compete with the store with the 11am delivery. It allows West Coast and East Coast people to get the books at the same time. It's fair. The result of blown street dates or uneven street dates between trades is eroding the value of street dates and eventually they'll be ignored. The other possibility is that I order my Wizards books from my book distributor, which puts me on the same playing field with Barnes & Noble and the big boys. It's not as good a fit for game stores though and I think it undermines the hobby trade, which Wizards should remember they need for all their other games. 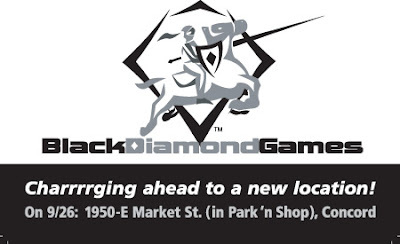 Black Diamond Games is probably in the top 10% nationwide when it comes to game store revenue. This is partly a sad commentary on game stores but it's also because of our location in the San Francisco Bay Area. Revenue does not equal profits, in case you think I'm bragging. The high price of running a business in California is astonishing. I know of stores in the Midwest with similar revenues who have multiple employees, giant stores and time and money to take vacations. The kind of money we spend generally means we get listened to in the industry, at least where there's competition, such as with distributors. They court us, generally treat us well, offer us special deals like secret discounts and free stuff. In other words, they show a little respect, much as game stores do their valued customers. It's just common sense. So it still blows my mind when a vendor won't give me the time of day. Landlords are notorious for this. My current landlord made me go through an interview process to prove to him I knew what I was doing. His property manager confided in me last month that they really didn't expect us to make it to the end of our lease. 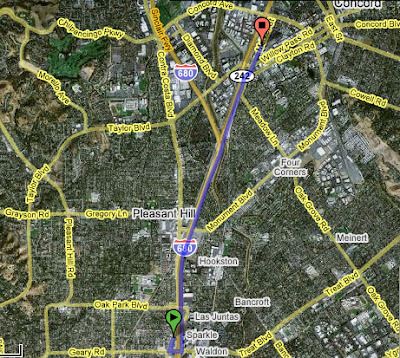 Our original move location was in Pleasant Hill. After calls to the landlord over many months, they still haven't called us back. Luckily we're moving to a new place where the landlord is as eager to have us as we are to move in. My current problem is with the purveyors of corn based fizzy drinks. With a large game center, we need to stock a large selection of snacks and drinks. Our arcane vending machine, with its constant user support and ability to be disabled with a nickel, just won't cut it anymore. So we need to talk with the big boys, Coke and Pepsi. Pepsi won't return my calls. What can I say. I've called them repeatedly and their sales people won't call me back. My Coke rep finally showed up today, kinda. I called them four times over six weeks. They completely blew off one appointment, not even calling to apologize. Then this morning they blew me off again. My rep called hours later to tell me that, basically, he was busy with a more important client. He showed up this afternoon (5 hours late). Coke guy: We've never really dealt with a business like yours before. How exactly does this whole thing work? Me: Thirsty gamers in large game room here (pointing to the map) must be hydrated and they prefer your products, located in the cooler here (pointing to the map). Would you please let me have some? I sell X amount now and anticipate 4X later. Me: Also, Mountain Dew is my top selling drink now. I know it's from Pepsi, but can I stock it in your cooler? Coke guy: Absolutely not. It's not allowed. Besides, we have Hyper Cola and Red Hyper Cola, just as good as Mountain Dew. Me: Err, what? Never heard of them. Hmmm, let me explain it a different way. As you can see on this diagram, next to your cooler is the Pepsi cooler. I'm only getting Pepsi for the Mountain Dew and I would hate to have to sell all the other Pepsi products too. Coke guy: Ok, you can do it. Just Mountain Dew. But if anyone asks, you didn't know. Anyway, he says it will take a week to get back to me with a simple quote. Still ridiculous and I'm sure I'll have to stay on top of him just to get that. Meanwhile Pepsi can bite me. After a lot of research on store names, I decided to use regional parks for my inspiration. They're linked to the community and they often have colorful names. For example, I considered Wildcat Games, named after the Wildcat Canyon Regional Park near my house. 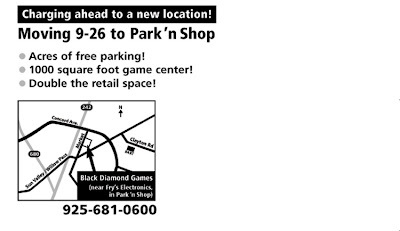 I still think that area could use a game store. Think of a regional park in your area and see if I'm right. 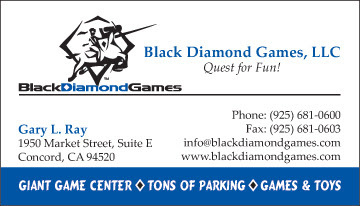 Black Diamond Games was named after the Black Diamond Mines Regional Park in Contra Costa County. "Black Diamond" refers to the coal that was mined from this region in the 1860's. Most people in the area know nothing about the park. A number of people accused me of ripping off "Black Diamond" from other local businesses. 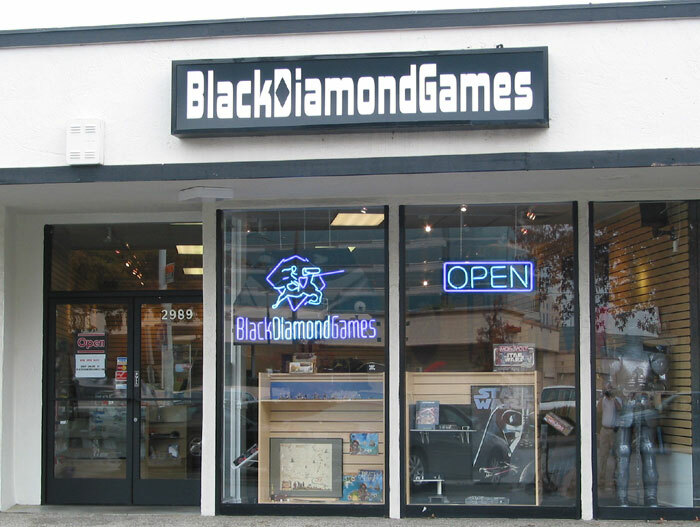 I did a business search and there were over a hundred "Black Diamond" businesses in California. If I'm guilty of anything, it's lack of originality. One of my customers who knows the history of the park very well runs an interesting Dungeons & Dragons adventure at the local convention (Dundracon). He uses actual maps of the Black Diamond mines for a dragon's lair. Our logo has a story too. We took the name Black Diamond Games and sponsored a logo design contest. We gave some vague logo design guidelines and let graphic designers from all over the world compete. There were wizards that looked like the Dungeon Master from the D&D cartoons (some looked like child molesters). There were simple diamond shaped designs. There were scary knights that were likely to give small children nightmares. I wish we had kept all the logos that didn't make it. Some were really interesting. Below is the winner, by a designer known as "Blazen." My total cost for the logo was about $250. There's an alternate design floating around my hard drive where the knight is wielding a sword, but for some reason it seems violent, as if wielding a lance can be related to a game, like jousting, while a sword shows more lethal intent. Every once in a while that sword wielding knight accidentally ends up on a document by mistake. People have been curious about the nuts & bolts of running a game store, especially if they've thought about running their own store. One of the topics I enjoy, and that nobody ever explained to me properly when I started, is purchasing. Most game stores buys $100,000-$200,000 of games each year from distributors and manufacturers. When you're starting out, there's no guide for doing this. Retail isn't taught in schools. You can't take classes in it. 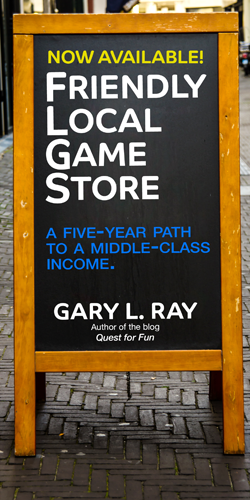 The few retailing books vaguely describe it and often in language that doesn't match the game industry. Yet, buying is something that's been done by merchants for thousands of years. First, I need to have available money in my budget to buy stuff. I know this based on a spreadsheet that's called "Open to Buy" in the retail industry. This is a simple spreadsheet that adds my cost of goods and money I've already spent to come up with an available balance. If you don't know retail, that $29.95 D&D Player's Handbook costs me $15. That $15 is my gross cost of goods. When everything is said and done, there will be another $3 in various costs associated with selling that book, such as theft, credit card fees, etc. So on the 17th I overspent by $50 but by the 18th I had a surplus of $75 to spend. Second, I determine what I'm going to buy. My point-of-sale system tracks everything I sell and it's cost of goods based on distributor pricing. Every item is set to remind me to re-order it at a certain point, or to ignore it if I tell it I'm through with that item. For example, I always want 3 copies of the D&D Player's Handbook, so when the stock falls below 3, it adds copies when I generate a purchase order. Although creation of the purchase order is automated, I still have to go through most items to see if I really want to order them again. Some items sold well at first, but may have petered out and need to be dropped. This is really important, because unless you're adding money to the inventory budget, there's no way to afford new items unless you drop old ones. It's especially difficult during the Summer months and before Christmas, when everything new is coming out. It's not uncommon for me to run huge deficits and slowly "burn" them off with holiday sales. Third, I decide what I want that's new. Hopefully I've chosen enough items to drop, or even better, budgeted money for a new release. Hopefully I've done some research and listened to my customers so I know what to buy. If I don't have enough money, I may need to forgo an item. Stores learn about new releases from what's called "The Daily." Every big game distributor as well as Diamond (comics) sends out a daily on every week day. Manufacturers usually send out a new product listing once a week. This is all the new stuff, and even more importantly, all the items that are back in stock. Each new item that you want to buy must be manually entered into the point-of-sale system or, if it's old, its entry modified to be re-ordered. Fourth, after all the new items from the daily are entered into the POS (point-of-sale) system and my budget has been checked, I finely craft a purchase order (PO), save it to PDF and email it to my distributor. My POS system can electronically submit PO's, but no distributor has the system to read it. Instead, someone pounds out my beautiful PO into their order system and they call me. This is the call where they tell me "how they're going to save me money." In other words, they don't have everything I want. They'll also tell me "how they're gonna make me happy," with some last minute items that got pulled off a truck and will likely break my budget. So my budget gets all wobbly with these pluses and minuses, but it works out in the long run.There are three types of interesting inventory problems that happen when you order incorrectly. One is when you expand or are just lazy with your purchasing. Your inventory bloats and the money you were supposed to use for rent and your salary are instead sitting on your shelves. The second is the "inventory death spiral." You realize you can't pay your rent, so you stop restocking and buying new games. Because you stop buying, your sales fall. Because you're sales have fallen, you continue to stop buying. Your inventory shrinks as you spend your shrinking inventory dollars to cover your costs. This can also happen if you buy the wrong inventory in a big way.The third problem is managing categories. If you've got a big category that accounts for a good portion of your sales, like Games Workshop, comics or toys, you need to track them separately. If you don't, you can have problems balancing your inventory. Say you sell $2000 in Games Workshop over the weekend and don't re-order. You have $900 in your purchasing budget, but rather than re-order GW, you buy the new Magic release. You no longer have that Games Workshop money until you sell all your Magic (although you may have planned it this way). Unless you track your inventory dollars by department, you'll slowly see a shift in your store inventory. I find this to be organic, but some people might find it undesirable. For example, our inventory slowly moved from card games and role-playing games to miniature games. The miniature games were doing well, there were many new releases and new product lines, RPG and CCG releases were sparse, and eventually miniature games sucked up all the inventory dollars. We didn't plan this! Luckily, we're happy with it, but it could have been a bad situation. For example, if my toy inventory dollars started creeping into my game inventory because it wasn't toy season, I could find myself needing thousands of dollars to bring my toy inventory back to normal for the holidays. As I mentioned, I talked to a lot of game store owners about game space, including whether to charge for it. Some stores charge per head. Others only allow people to use the space for scheduled events. Gary at Great Escape Games was insistent that it be free and available. Endgame also has free game space in their game center. Game space is always free. We may occasionally charge a tournament fee, but it will be used for tournament prizes. In the case of role-playing events, we may charge a nominal fee, maybe $5, that can be converted into a $5 gift certificate. So you pay $5, but you get a $5 gift certificate. RPG events work the least well of any store events but we'll always have them. Anyone can use the space at any time. You can come in and play whenever we're open. You can play whatever game you want, preferably games in print. The exception is if we've got an event scheduled AND we need the table space. Most events won't take up every table, so your chances of finding a space are good. The two 4x8's will be in demand. Eat and drink what you want. Bring in your outside food and drinks if you want. We're not mean movie theater people. We'll have drinks and snacks, but we're not enforcing any rules that you must buy food and drink from us, as if we're the profiteering company store. Why? It's not enforceable and it annoys people. Ideally the store wants to have events every night of the week. We're aiming for two at the same time. What we're hoping to find are volunteers to run these events. We already have a good number on the calendar, but we're looking for volunteers. I've talked with many store owners about how they run their game room. Some see a game room as a huge drain on a store's resources in rent, employee time, destroyed folding chairs and event planning. 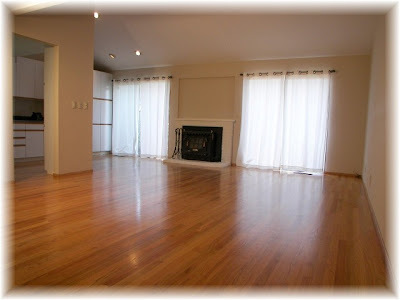 Many don't want a game space and some have eliminated their space for additional inventory. They suggest charging for game space. Other store owners insist that a game room is essential for building community and that it should always be free and available. Originally I listened to the first group of anti game space people. Why? Personally, I've never gamed at a store before owning my own. I only played role playing games before the store and I still think they're best with a core group of people, preferably at home with the Cheetos and Mountain Dew. I find convention games unsatisfying, at least the ones I played in at OrcCon in Southern California when I was a teenager. Second, I just didn't have enough space in our first store and to not need game space was exactly what I had hoped to hear. Over time our current store went from having zero game space (it's even forbidden in our lease) to having two tables or even more if we can pull it off. Last weekend was World Magic Day and we had 16 people playing at $20 each (they each averaged out to about $50 that day). Why 16? Because we had enough tables and chairs for exactly 16. We probably turned away another ten. Each Sunday we play Warmachine. The new Summer tournament just started. I have the day off, but I know it went well because we sold a ton of Warmachine last Sunday. The same is true with other planned events, with the exception of role-playing games. RPG players seem not to spend much money on event nights, although they do spend it throughout the rest of the month. I think there is a wrong way of looking at game space. The wrong way is to be to0 analytical and use a business model. For example, logically you would like to say: My 1,000 square foot game room is costing me $2,070 each month, plus the cost of heating/cooling, bathroom supplies and broken folding chairs (probably one a month at $17 each). Do those gamers who use the space buy enough stuff to cover those costs? Would they have bought that stuff anyway? The answer is that it's way more abstract and fuzzy. Game space is what differentiates a game store from the Internet, from the comic book store, from the Barnes & Noble, and other game store competitors. Having it is a huge reason to come to the store, plus there's the economic argument above. Yes, it does drive direct sales from game room users, but it also creates community. That community is what's desperately needed nowadays. Yes, you can play D&D with your friends, but the most popular games nowadays are miniature and trading card games. These games require a variety of opponents, as opposed to the usual gaming buddies. I was part of a podcast with Ogrecave a few weeks ago about Free Rpg Day. I have to say, I was pretty nervous. Public speaking isn't exactly my strong suit and when it comes to the game industry, my level of annoyance can be stratospheric. I just didn't want to stick my foot in my mouth (that's what a blog is for). 2d6 Feet in a random direction. This is some good game industry talk with Chris Hanrahan at Endgame, Brian Isikoff, Allan and Mike Sugarbaker, etc. It's probably the most frank show about the game industry, akin to having a beer with these guys. My industry experiences usually resonate with theirs. Ogrecave. This is more gamer centered but is also about industry news and reviews. There are very good reviews on the website and a blog-like comment section in the news portion of the site. Fear the Boot. Great roleplaying advice and general goofing around. This is one I've just started listening to. The Dice Tower has excellent board game reviews. Wizards of the Coast has an official D&D podcast. It's good if you want to learn about what's in a particular D&D book that month, otherwise it feels like an assignment rather than a spontaneous labor of love. Pay attention to Mike Mearls; he's a D20 designer worth listening to. Carol Shroeder has a very good book called Specialty Shop Retailing. Her podcast has a lot of good advice on running a specialty retail store. The Wall Street Journal has a small business podcast series that's usually worth listening to. Got a good gaming or small business podcast to recommend? Let me know. This is a basic layout using Visio. It's mostly to see if things will fit in the store. As we're going from less than 1000 square feet of retail space to 2000, I'm thinking we'll be fine. However, we're adding 60% more inventory, so maybe we want to map that out. The quick tour: You've got your front door on the left side. A suit of armor looks out from a window on your left. As you walk in, you're completely oblivious to the four gondolas (racks) directly in front of you, comprising mostly of game listing boards, free flyer's and various flavors of Monopoly (skip the monopoly, it's for your own good). As your eyes adjust to the light, your ears and brain register a rousing fantasy film soundtrack playing in the background. You look to your right (everybody seems to do this naturally). At the right front of the store are toys. There's a Thomas the Tank Engine rack, bright blue and framed with track pieces. At the front of the store, facing the window, is a Thomas play table and a tall rack full of various bits of track (from Melissa & Doug). You also see before you a rack of ERTL cars and trucks (don't step on the young'ins playing in front of it) and a rack of Schleich medieval, fantasy and Wild West toys. Racks and book cases full of colorful toys fill this quarter of the store. To your left are board and card games, filling the front quarter of the store. You'll notice what you think are many new board games. They're probably not new, only displayed so you can actually see them! We also have puzzles in this section for kids and adults (I may move the kids puzzles to the kids section). We have around 500 board games now, the top 200 from boardgamegeek and a bunch more. We also have over 300 card games. We're adding maybe 50 or 60 more games with the move. In the middle of the store on your left is a small lounge area with a couple of chairs and tables. In this little nook resides our comic book racks (two of them). Take a load off your feet and check out our trade paperbacks and weekly comics. Right now we stock the top 100 comics of all time, with plans of expanding that section with new books as they're released. This section is also a likely "mom lounge." We'll make sure to have a little table here with something other than just comics. In the very middle of the store is what's called the "cash-wrap" or register area. 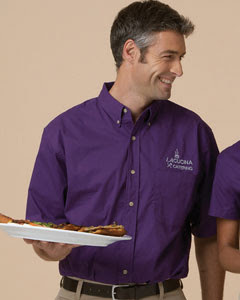 Here you'll find helpful staff who always greet customers as they arrive and offer their expert services (they better!). The cash-wrap area will feature snacks, CCG binders, and wondrous items in display cases that beckon you to fondle them. Hey, it's my dream store; I can dream! The reality of store display cases is that they're a dead zone. Customers want to touch things and pick them up. Put something behind the counter, or worse, behind glass, and you cripple sales. Yet, we have display cases because they're convenient for store owners. In the general area around the cash wrap will be collectible card games, card game supplies and dice. I'm a little fuzzy on how they'll be arranged as I want them to a) be accessible and easy to find/grab and b) not get stolen when I turn my back. These are competing priorities, but I think we can figure it out without a camera system (another post for later). 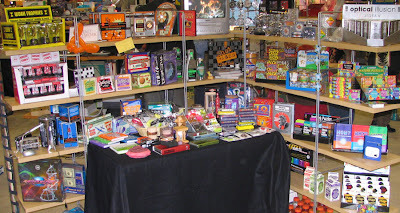 The back left quarter of the store is devoted to role-playing games and collectible miniatures. It will be slightly larger than what we have now. Hopefully the layout will allow a bit more room for browsing. After we open we'll have to set up a clever RPG display, possibly a cool Dwarven Forge setup. The back right of the store is all about miniatures. The space will be expanded but the inventory will be much the same. The space will be spread out better, using more racks. We're just flat out of space right now, so it's often hard to navigate the miniatures section. We're going to try to re-launch games like Warhammer Fantasy and 40K. If they take off, mostly due to events in our larger game space, we'll expand our offerings. We already have the entire lines of both Warmachine/Hordes and Flames of War. Towards the rear of the retail space we will have drink coolers. We'll still have our funky vending machine, but I'm also trying to get coolers from Coke and Pepsi for larger bottles, more variety (including water) and things like energy drinks. We'll have plenty of snacks as well, both Japanese and your typical game store fare (ala Costco). The funky vending machine will be devoted to one-off drinks Coke and Pepsi don't sell: Canada Dry, Dr. Pepper, etc. So that's a skeleton of the store. It's really boring and desperately in need of some fun displays. Maybe we can make a cool Thomas display, or break out the Miniature Building Authority and build another village. We plan on having a number of miniature game demo tables as well. The Game Space: I count 10 standard 3x6 tables and 2, 4x8 tables. The 4x8's will have tall wooden stools instead of folding chairs. If you count up all those chairs and stools, I see room for 60 people! Will all those tables fit in there? I'm guessing we'll lose a couple when it's all said and done, realizing it's a bit too crowded. We already have events scheduled for the space: World D&D Day and an auction in November. Also be sure to save the date for our Grand Re-opening on November 4th. Who is this Gantt Guy Anyway?